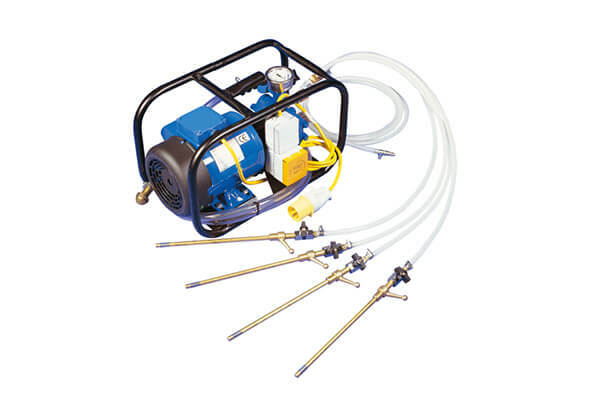 Kingfisher Building Product's DCP Injection Pump is specially designed and built for injection of damp proofing fluids and incorporates many features not found on lesser pumps. The pump is corrosion and solvent resistant, the 0.75 kW electric pump delivers up to 13.6 litres of fluid/minute. The pump is protected by the rugged steel frame with solid brass fittings. Widely respected and utilised by thousands of remedial contractors, Kingfisher Enviroject injection fluid is simply the highest quality chemical damp proofing available.